November 9, 2010 - US Airways announced that it will need 500 crew members next year primarily in anticipation of planned retirements and attrition, which will be filled by recalling employees currently on furlough, as well as through hiring new crew members. The majority of these returning and new pilots and flight attendants will be flying by July. "This is great news for our workforce and the communities we serve," said US Airways President, Scott Kirby. 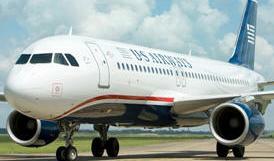 "We look forward to welcoming our colleagues back to US Airways, and bringing new crew members onto the team." "Our crew member hiring needs are being driven primarily by planned retirements and attrition, as well as international growth. Today's announcement is consistent with our previously announced plan to keep our domestic capacity flat in 2011 while growing international capacity by 8 percent." The 2011 crew member plan includes filling 420 flight attendant positions and 80 pilot positions. The Company will first offer these positions to employees currently on furlough status, and once this process is complete will begin hiring new employees. After the recall, US Airways will have no flight attendants on furlough, and may have up to 100 pilots remaining on furlough. When the recall and new hire process is complete, the airline will have approximately 4,970 active pilots and 7,300 active flight attendants. US Airways, along with US Airways Shuttle and US Airways Express, operates more than 3,100 flights per day and serves more than 200 communities in the U.S., Canada, Mexico, Europe, the Middle East, the Caribbean, Central and South America. The airline employs more than 31,000 aviation professionals worldwide and is a member of the Star Alliance network, which offers its customers 21,000 daily flights to 1,160 airports in 181 countries. Together with its US Airways Express partners, the airline serves approximately 80 million passengers each year and operates hubs in Charlotte, N.C., Philadelphia and Phoenix, and a focus city in Washington, D.C. at Ronald Reagan Washington National Airport. US Airways was the only airline included as one of the 50 best companies to work for in the U.S. by LATINA Style magazine's 50 Report for 2010. For the sixth year in a row, the airline also earned a 100 percent rating on the Human Rights Campaign Corporate Equality index, a leading indicator of companies' attitudes and policies toward lesbian, gay, bisexual and transgender employees and customers.